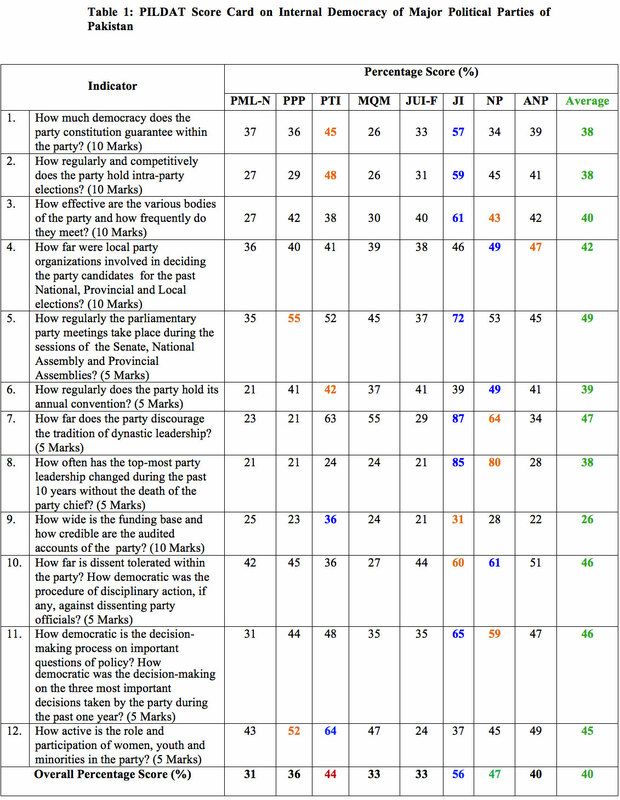 February 22: In a systematic evaluation for the second year (2015) of internal democracy of political parties in Pakistan conducted by PILDAT, the Jamaat-e-Islami (JI) has again emerged as the most democratic while the Pakistan Muslim League-Nawaz (PML-N) has again ranked as the least democratic party. 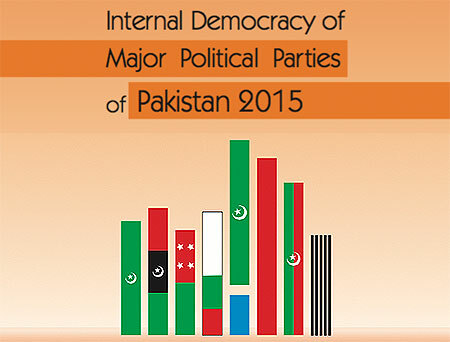 The PILDAT Report on Internal Democracy of Major Political Parties of Pakistan 2015 concludes that the selected eight political parties received an overall score of 40 out of 100, which indicates a drop from the overall score of 43 in 2014. This shows that the state of internal democracy of political parties in Pakistan — although not in a good shape the previous year- further deteriorated in 2015. Within this overall score, the indicator of Parliamentary Parties’ Role in Developing Party Position received the highest score of 49%. Discouragement of Dynastic Leadership in parties scored 47%, which is the second highest score followed by Tolerance of Dissent within parties with a score of 46%. Credibility of political parties’ annual statements of accounts submitted to the Election Commission of Pakistan and whether their funding base was wide enough, received the lowest score of 26%. PILDAT’s 2014 Report had shown somewhat similar results in that the two weakest indicators were change in top party leadership, lack of credible funding base and audited statement of accounts. Regular elections, regular change in leadership through election, regular meetings of the Consultative Council (Shura) and the Working Committee (Aamla) and discouragement of dynastic leadership within the party, have apparently favoured the Jamaat-e-Islami (JI) rated as the most democratic political party. A landmark amendment was made in the constitution of the party in October 2015 in which 10 seats have been allocated for women in the party’s Majlis-e-Shura. Although Jamaat follows a particular type of internal democracy in which there are no candidates in party election and election campaign is not allowed, this peculiarity has not come in the way of the party securing top position as the most democratic party. The National Party (NP) (currently led by Senator Mir Hasil Khan Bizenjo) has emerged as the second most democratic party of 2015 with an overall score of 47%, which is a significant improvement over party’s 4th position in 2014. Regular change in top leadership since its founding in 2003, party conventions successfully conducted in 2015 in which transparent party elections also took place for all four provincial chapters of the party, and lack of any sign of dynastic leadership have favoured the democratic credentials of NP. On the other hand, the PML-N has once again ranked as the least democratic party. Irregular or no party meetings, lack of competitive elections and continuation of the same leadership since the founding of the PML-N are the factors perceived as the major weaknesses in the democratic character of the party. 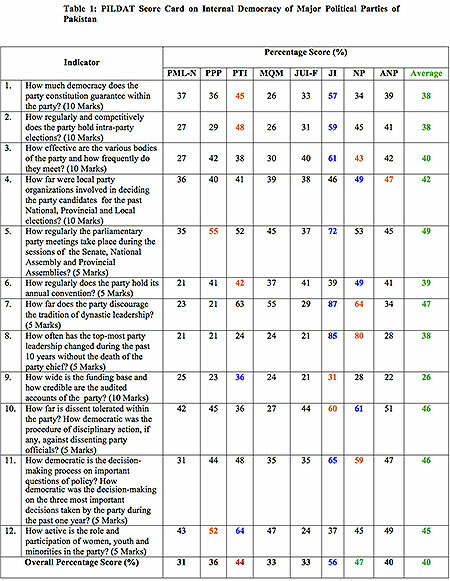 The PML-N is followed by the MQM and the JUI-F, rated as the second least democratic parties among the eight parties evaluated. In order to assess democracy within political parties objectively and scientifically, a framework consisting of twelve (12) indicators was devised by a broad-based Steering Committee constituted by PILDAT. Eight (8) major political parties were selected for the assessment. Five of these parties (PML-N, PPP, PTI, JUI-F and MQM) hold the largest number of seats in the current National Assembly (2013-2018). Three other parties were chosen to either represent Balochistan (NP) and Khyber Pakhtunkhwa (ANP) or to capture a peculiar brand of internal democracy in the form of the Jamaat-e-Islami (JI). A party-wise account of each of the twelve (12) indicators was compiled after collecting data from various sources including the political parties. This account became the basis of quantitative assessment (scoring) for the parties. 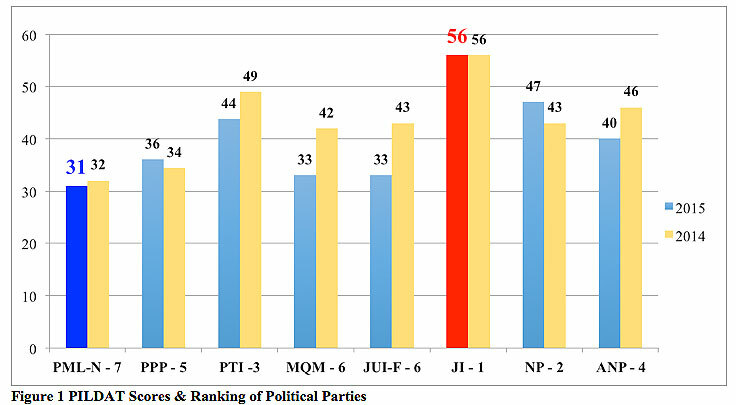 The PILDAT Score Card assessing internal democracy of eight political parties in Pakistan places the Jamaat-e-Islami (JI) with 56% score (No. 1), the National Party (NP) with 47% score (No. 2), the PTI with 44% score (No. 3), the Awami National Party (ANP) with 40% score (No. 4), the Pakistan Peoples Party (PPP) with 36% score (No. 5), the Jamiat Ulema-e-Islam-Fazlur Rehman (JUI-F) and Muttahida Quami Movement (MQM) (Both at No. 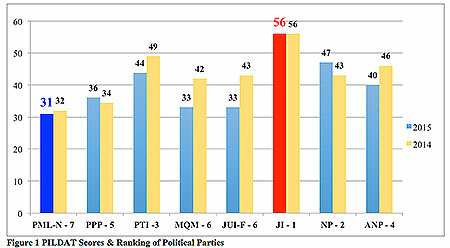 6) with 33% score, and the PML-N with 31% (No.7). Mr. Ahmed Bilal Mehboob said that as an organization carrying out regular research on issues related to the state of democracy in Pakistan, PILDAT finds this converse relationship of internal democracy and mass appeal quite worrying. Furthermore, PTI’s internal democracy seems to be at a defining stage.